Location - International Piano Competition "Roma"
The main venue of the International Piano Competition “Roma” is located in the area of the port of Riva Grande, in the heart of Trastevere, where the Genoa’s colony since 15th Century owned warehouses and stores. Meliaduce Cicala, the Ambassador of Genoa to the Pope, bequeathed that with his inheritance, was built a hospital for sailors in need of treatment. 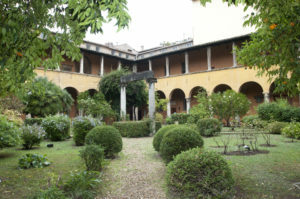 This hospital, born of own will of Pope Sisto V, was built where now is the area of the Confraternity and was called S. Giovanni Battista, because it adjoined the church entitled to the Saint, beloved by the citizens of Genoa. After the “Sack of Rome” by the Lansquenets the church and the hospital, partially transformed in workhouse, were closed. In 1553, with bull of Pope Julius III, was founded the Confraternity, noble institution of the catholic laity, having since 16th Century noteworthy privileges. It was entrusted with the management of the hospital that could receive sailors coming from different parts. After the first repairs in 18th Century Roman baroque, followed the existing one in Roman neo-classical. Once again, this year the “Roma” International Piano Competition will take place in the picturesque frame of the Cloister of the Church of San Giovanni Battista de’ Genovesi. 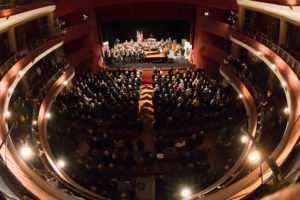 The Winners’ Concert with the awarding of prizes, which takes place on the last evening of the competition, takes place at the Theater Quirino-Vittorio Gassman. The Theater Quirino-Vittorio Gassman is a historical reality of excellence in the Capitoline theater scene. At the entrance, photos of the protagonists who have made his season famous, welcome the spectators who are approaching the theater with curiosity. A deep foyer, complete with a cloakroom and ticket office, surrounds the Hall which, with its 850 seats, offers a wide and varied cultural offer in the field of live entertainment. They frame a bookshelf where you can relax and immerse yourself in reading and listening to books and vinyl records that the theater offers and a Bistrot in which to taste wines and delicacies of excellent quality.